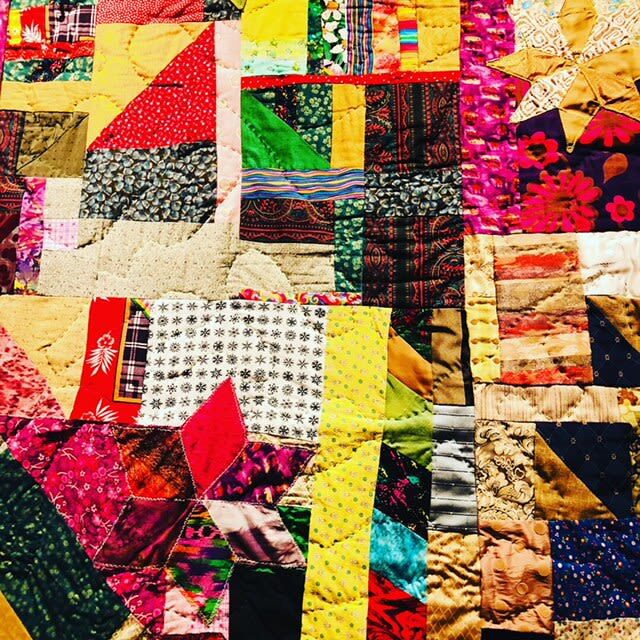 Over twenty-four traditional American and Afro-Caribbean inspired quilts are on view by Cecelia Pedescleaux, Susan Charles, and Edith Gross. Cecilia Pedescleaux and other quilt artists take inspiration from the past while introducing new techniques. “There are so many new things that even 10 years ago some of these techniques would not have been thought of as quilting,” Pedescleaux said. “There are so many that people do. I’m not exaggerating. There’s a book called ‘1001 Quilt Patterns’. It’s not your grandmother’s quilting anymore,” said Pedescleaux. She continues “there’s a lot of creativity with people, especially with females. Here we are able to work together in a nonjudgmental way and help each other. If you can’t paint or sculpt, this is something you can do, and it is portable,” said Pedescleaux. “In 2012, with the help of grants from the Joan Mitchell Foundation and Creative Capital, the Creative Alliance of New Orleans was able to provide business training for 24 artists. Cecelia Pedescleaux was one of them. We have followed her career ever since and have been thrilled to learn a quilting group she formed to bring others into this very homegrown but always beautiful art form. We respect the beauty of the work and the fact that it is so homegrown. It comes from the hands of people in their homes who are usually untrained. So it is really a pleasure for CANO to present this exhibition that I think people will be thrilled to see.” , said Jeanne Nathan, Executive Director of the Creative Alliance of New Orleans. This unique show will be on view until early March. The Creative Space is located on the Third Floor of the Myrtle Banks Building, Above the Dryades Public Market. Paring in rear on S. Rampart Street.